towards the +10mW total of 532nm. Powerful, but died after 3 years use. I actually ordered 10mW and what I received was more like 22mW. I was stoked and hastily recommended this product to all of my friends. Only several months after I got it, though, it started to flicker. The spring inside does not have enough tension, so the battery compartment loosens up over time and the laser will only work tilted at certain angles. So I had the idea of trying to stretch the spring out with pliers. It worked like new for a while, then lost its tension again and started to rattle and flicker. After a while it's stopped working completely. I treated it well as I do all my electronics. Such a great product otherwise and would have been worth way more than I paid for it if it weren't for this one simply yet fatal flaw. Rather expensive for only lasting a few months, though. Disappointed. I'm not by any means a laser expert or any sort laser connoisseur, but I do know what quality looks and feels like. The visual impact of the laser's casing and the box are just ok, Wicked Lasers obviously make huge efforts to give products that look good even when they're off. However, the inside is what really counts, and Optotronics is the best. 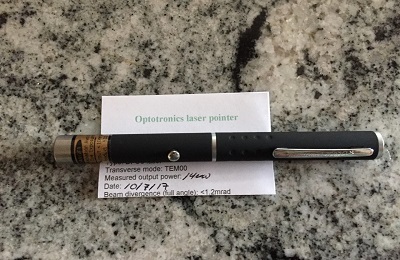 I've only owned crappy laser, but now that I know what quality feels like, I definitely won't be buying form anybody other than Optotronics.